What is the best in-ground dog fence? The answer will be up to you and depend upon your personal preference. However, we’ve done our best to bring together examples of each type of in-ground dog fence to provide you with all of the options that you need. Before we get started with the shopping, here are some things you should keep in mind. Afterward, check out our extensive list of the best in-ground dog fences. 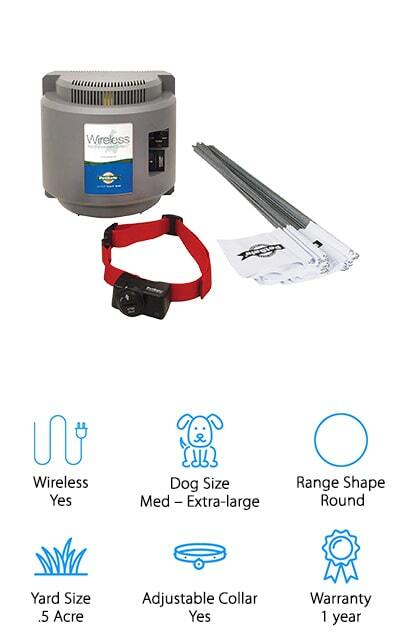 Wireless: There are two main types of in-ground dog fences. Either you have to plant wires to create a boundary yourself, or it’s done wirelessly. We’ll let you know which you can expect to receive here. Dog Size: Some of the collars on this list don’t have adjustable levels of correction, so you will need to be mindful of the size of dog you have so you don’t accidentally hurt them during training sessions. Range Shape: While some fences have a required range shape to work properly, some can be set into any shape as long as there is a complete circuit running through the transmitter. Keep this in mind for your property. Yard Size: How much yard will the transmitter service? This tells you how much wire comes with the system, though you can usually expand it to a much larger boundary with the installation of additional compatible wires. Adjustable Collar: Does the system come with collars? Most come with a receiver that you clip onto your dog’s current collar, while there are still some that have their own special collar arrangement. We’ve got you covered with this information. Warranty: A warranty is an insurance policy and an acknowledgment that the company stands behind their product. If it breaks or ceases to work before this time is up, you may get a refund or replacement product. On to our in-ground dog fence reviews! You want your dog to be safe and we want that too, so that’s why we’ve compiled this list of the best invisible dog fences. It will keep them from running into the road or other types of dangerous activities. Check out our top pick and budget pick first, as they are our personal favorites. Make sure to read to the end of the list – you just might find what you’re looking for. The best in-ground wire dog fence that we found during our research is this one by Extreme. The included wire covers about six acres of land, and it comes with all of the electronic options that you need. The collar receiver that comes with the set can be placed on any dog collar and is completely waterproof down to 10 feet. If your dog loves to swim, you’re both going to love this fence kit. You can bury the wire in any size or shape that you want, as long as the electronics can handle the size. 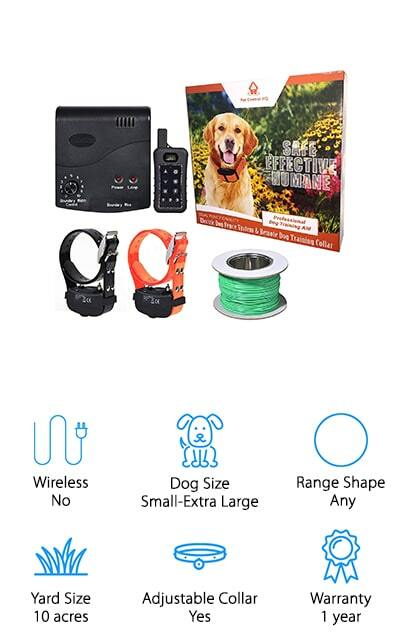 It comes with a digital transmitter to help spread the signal to your dog’s collar, as well as training flags to help alert the dog to where the boundaries are. This is a useful training tool. You can adjust the collar strength for each individual dog, so you can use it to train puppies and bull mastiffs alike. Sit Boo Boo makes a large variety of the best in-ground electric dog fences on the market right now. This particular fence comes with 955 feet of wire that you can plant to create your boundary. You can define where the boundary is by laying the wire out yourself, which is a perk that wire fences have over wireless ones. 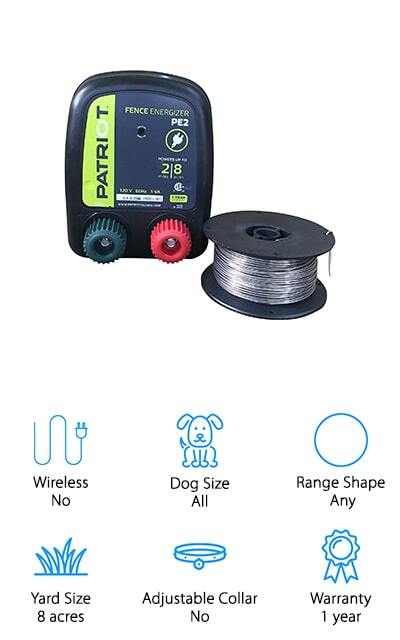 You can purchase additional compatible wire in order to extend the boundary out to a maximum of five acres so that your dog can roam a little freer on your property. You can add as many collars as you want to the system and they work just the same, which is great if you have multiple pups. The included wire can cover up to 1.2 acres of land, so you’ll still have plenty of room even if you don’t extend it out. It’s inexpensive and easy to set up, giving it a place in our best in-ground dog fence reviews. This in-ground wireless dog fence by PetSafe creates a wireless boundary that doesn’t require you to bury any wires in order to define your space. It defaults to a round area that stretches over a ½ acre. The receiver collar is adjustable and can be switched to five different levels of static correction, with a tone-only mode that is really useful for training your dog where the initial boundary is. When you follow the directions as they come with the kit, you can have your dog trained to respect the invisible boundaries within two weeks, and that’s a great thing! It’s great for dogs over 8 pounds with up a 28-inch neck. It’s easy to set up in about an hour, so you can be up and running in no time. It’s ideal for camping spots and vacation homes, though function will be affected by terrain sometimes. This is a great fence for training your dog! PetSafe makes this in-ground invisible dog fence that you can use to cover about a third of an acre on your property. 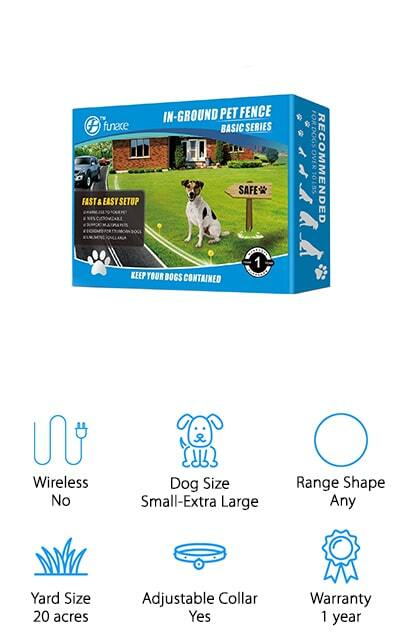 It comes with a ton of copper wire to help you dig and define the boundary that will keep your pup safely on your property, rather than on the road or in someone else’s yard. You can use any insulated copper wire between 12 and 20 gauge to expand the fence to cover about five acres. It comes with training flags that you put at all of the boundaries so that your dog knows where to stop and learns where the visual boundary is without having to use the collar’s vibration functions. You can set up additional boundaries within the larger one, such as creating a space inside your garden where you don’t want your dog. You can adjust the level of correction on your dog’s collar as well, including a tone-mode for training! If you’re dealing with a stubborn dog, in-ground fences might be able to help you train your pup to stay where you want them to. That’s the case with this electric fence from Pet Control HQ. It comes with correction collars as well as bark collars, so your dog can’t stand at the boundary and bark at whatever he sees beyond it. There are an amazing ten different vibrational levels on the receiver, as well as three levels of static. You can really customize the training experience to the size and stubbornness of your pup. It comes with an adjustable, waterproof collar that is extremely high-quality, and you can purchase additional ones to train up to three dogs at the same time. You can set up smaller boundaries within the larger yard. You can install this fence in-ground or you can install it above ground depending on your yard and preference. It’s simple to put together! If you own a large dog, you know that it can sometimes be a challenge to train them. That’s why we recommend this SportDog In-Ground Fence for larger dogs. It covers a lot of acres when you first pull it out of the package, with its ability to reach about 1 1/3 acres, to begin with. You can extend this up to an astounding 100 acres with additional wire. It’s the perfect fence for larger farms, and for giving your large dog a little more room to run. There are four different settings on the collars, from tones to vibrational settings. You can train all of your dogs at once because you can add an infinite number of collars to the system. This fence system is advanced, and the battery on the collar lasts between six months and a year on average! This is one of the best in-ground fences for large dogs on our list. No list of the best in-ground dog fence reviews would be complete without including the Patriot PE2. Instead of using the copper wire that is more common on our list, this fence uses aluminum wire to create an invisible barrier by planting stakes in the soil. It will keep your dog from digging, and it will also keep deer and rabbits out of your boundaries so they won’t eat your plants. It works without a collar and actually seems like more of an electric fence than an in-ground boundary fence. If you’re tired of filling in your dog’s holes and you definitely don’t want him getting out (or deer getting in), this might be the fence to you. It’s definitely unique on our list, and maybe it’s just what you need. You get 250 feet of wire to start with, and you can always purchase more wire to expand the boundary out to the full 8 acres. Sit Boo Boo is back on our list with another easy solution for dog training. With this fence, you can easily cover 1.2 acres with the included 955 feet of wire. It’s an upgrade over previous models because it includes solid copper wire instead of hollow wire, improving the performance of the boundary. There are five correction levels on the collar transmitters, and they attach to any adjustable collar that your dog already has. 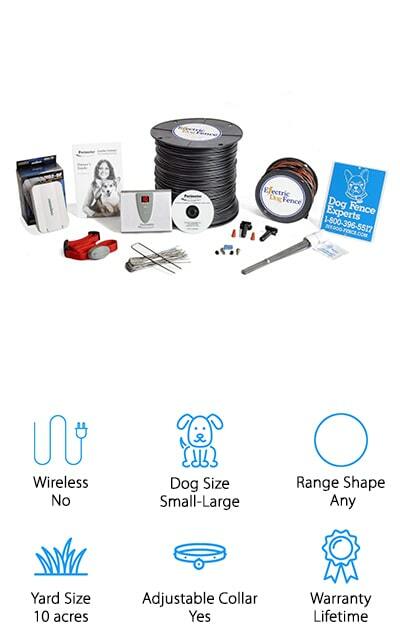 It’s quick and easy to set up, and you can add an unlimited number of receivers to your network to allow for training all of your dogs at once. 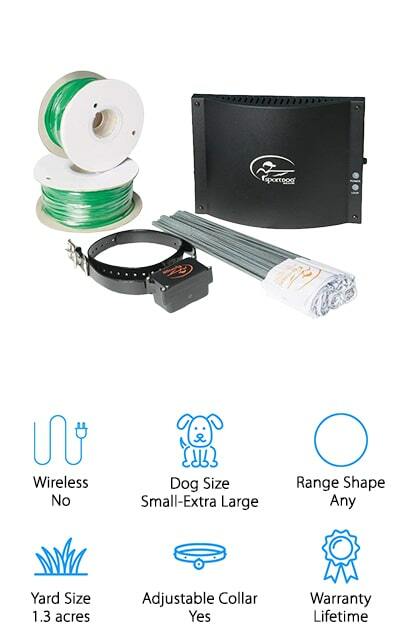 The transmitter in this set can cover up to five acres, so you can always purchase additional wire to give your dogs more room to roam. You can always customize the size of your range as well! We love the versatility in this dog fence, and it even comes with a lifetime warranty. 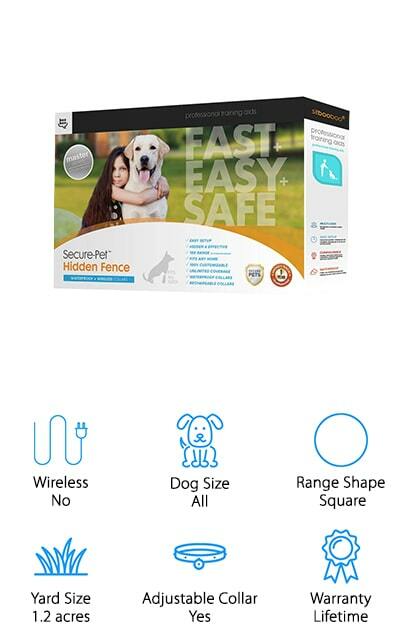 This electronic fence by Perimeter Technologies comes with enough wire to fence in your yard, but it can be expanded up to 10 acres so that your dogs can have complete access to your property – and only your property. When you order this collar, you can select the number of collars that you’d like to purchase so that you have everything up and going without ever needing to purchase additional collars (unless you get a new dog, of course!). The collars that come with the set will fit dogs up to 120 pounds, so it’s good for large and small dogs. If you want professional installation so you don’t have to lay the wire yourself, you can get Perimeter Technologies to send a technician out for an additional fee. We love having the option to get it done right the first time. Otherwise, it comes with everything you need to install it yourself or with help. 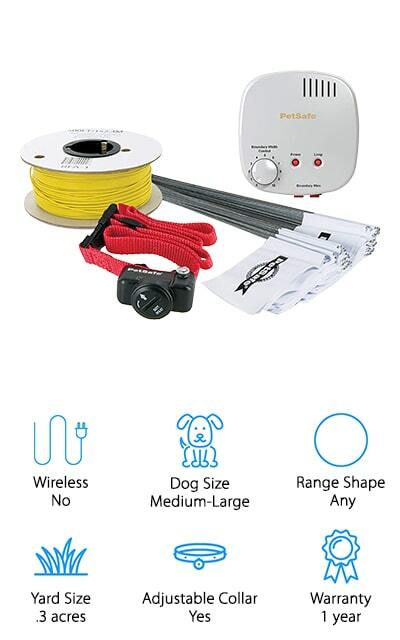 FunAce’s Radio Wave system will expand to support as many collars as you need it to so that you can train all of your dogs at once. Don’t worry about them getting off of your property or bothering the neighbor’s cat again! You can bury the wire in any shape to cover up to 20 acres of your property when all is said and done, though of course it only comes with the wire to cover a smaller space. You will need to purchase additional wire to expand it like most of the other fences on our list. The receivers can be attached to your dog’s collar, and they are waterproof up to 10 feet. 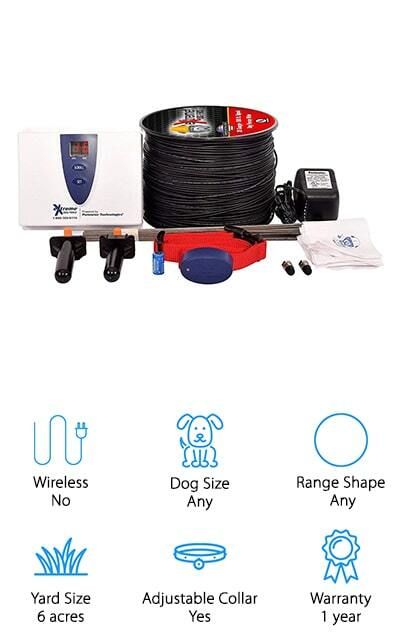 If your dog loves swimming, your receiver won’t be affected. If you have a stubborn dog that often takes trips out to the road, install this fence to keep them safe! You’ll have peace of mind knowing they are right where they need to be.